It was not so much the pressure of her long working hours that caused 28-year-old Huang Yan, an office worker in Beijing, to "freak out," but instead the clump of hair she found in her hand as she was washing it. Huang panicked, imagining that she would end up completely bald, a condition brought on by the stress and pressure of overwork that has afflicted so many Chinese millennials. Now, Huang spends 20 minutes a day using products to cover up her receding hairline, as well as spending some 1,500 yuan ($217.82) a month on anti-hair loss shampoos and hair volumizers. She spends up to an hour on complicated procedures including scalp massage and using essential oils. "I want to nip it [hairloss] in the bud, so I don't care about how much the products cost or how long it takes. I just care about whether it is effective. I'm willing to invest more [on my hair]," Huang told the Global Times on Tuesday. Normally seen as a condition that affects older males, Huang is not the only millennial battling to keep her long locks. On social media app Weibo, a thread called "the post-1990s generation looks like the post-1960s due to hair loss," has been viewed more than 240 million times. Some have coined a slogan - "what beats the post-1990s generation down is not poverty, but rather hair loss." The pattern is replicated across other social networks, where one can find tens of thousands of young people commenting on how to prevent hair loss, ranging from how to select shampoos and scalp nutrition, to acupuncture and food therapy. A report on news website jiemian.com blamed mental stress, poor sleep quality and a lack of discipline in one's life for the hair-raising problems. Wang Jun, vice president of cosmetic-surgery app Gengmei pointed the finger at the fast-tempo, high-pressure modern lifestyle younger people lead. It must be said, however, that stress does not affect normal balding in men as they get older - known as male pattern baldness, the jiemian.com report said. According to a report issued in September by AliHealth, a health app under Chinese tech giant Alibaba Group, people born after the 1990s, who are relatively new to the workforce, and people in the post-1980s generation, the main pillars of the workforce, struggle with hair loss issues the most. Among consumers who buy hair care and hair transplant products and services on Alibaba's e-commerce platforms, the post-1990s generation accounts for 36.1 percent of sales, just trailing the post-1980s' 38.5 percent. "China's younger generation has grown up in the era of consumerism, so they pursue a healthy and beautiful lifestyle. Losing your hair marks you out as unhealthy, so they are anxious and concerned," Wang said. This anxiety over premature alopecia has been translated into rising spending on hair-related products that many companies were unprepared for. 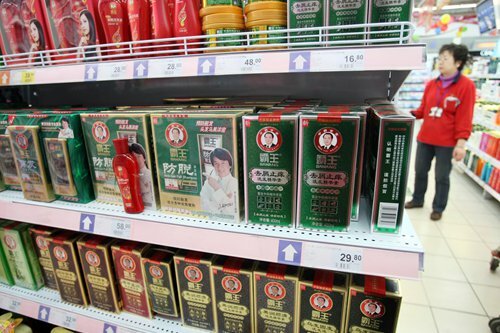 Wang Liang, vice general manager of Guangzhou-based shampoo producer Bawang, a household name in hair loss treatment in China, said that the company's e-commerce platform began to "see a substantial rise" in sales to young women in 2016. "At first, I thought they were buying for their parents, but after looking at their comments, I found they were really buying for themselves. And then I realize that our target market is shifting younger," Wang told the Global Times on Monday. Now, women aged between 18 and 35 account for 70 percent of Bawang's online sales, Wang said. The company is also diversifying its product lines to develop hair renewal liquids, hair masks and hair care essential oil in addition to its traditional products. To further lure emerging young consumers who like to joke about themselves on social media, Bawang also chose a young singer, Mao Buyi, whose name in Chinese means "every hair is not easy," as the brand's spokesperson. The endorsement generated a buzz among young consumers because of the homophone and it also topped the search metrics on Weibo in July. Adapting their strategy to younger generation's habits and tastes, industry analysts say, could potentially help pull Bawang out the red after years of increasing losses. In the first half of 2018, Bawang's revenue grew 17.6 percent year-on-year to 126 million yuan, yet the company still posted net losses of 11.4 million yuan. In addition to homegrown brands, foreign high-end hair care companies are also cashing in on the booming market among Chinese young people. From 2014 to 2017, sales of Ryo, a herbal medicinal hair care brand from South Korean cosmetic giant Amore Pacific, which targets the high-end market, shot up by 9,521 percent in China, with an average annual growth rate of 358 percent, data from market research firm Euromonitor showed. Amore Pacific did not respond to an interview request by the Global Times, but a senior executive from the firm attributed the strong sales to more demand from China's young generations for hair loss prevention and scalp treatments, jiemian.com reported. These products now represent 30 percent of Ryo's full range of products. Riding on the momentum, "the share of anti-hair loss products will grow further in the hair washing and care market," Wang from Bawang noted. The cosmetic surgery industry is also finding a way to get in on the act by offering hair transplants. Gengmei's Wang told the Global Times that the number of hair transplant patients who had booked procedures via the platform surged by 230 percent year-on-year in 2018. Among the patients, the post-1990s generation accounted for 10 percent, up from last year's 5 percent, although post-1980s patients are the biggest customers. The cost of the procedure is also increasing - now topping 10,000 yuan each, up 20 percent year-on-year. The balder the patient, the more expensive the procedure, Wang said. Data sent to the Global Times by SoYoung, another cosmetic surgery app, showed a 140 percent increase in the number of younger patients undergoing the procedure. The top two procedures are hairline restoration and transplants to the crown of the head. Gengmei has created a group within its app to answer questions from potential clients. SoYoung has created similar social media resources, which obviously target the younger market. Meanwhile Huang, the stressed-out worker in Beijing, is also considering a hair transplant. "If the products I buy don't work out, I'll put aside a few thousand yuan so I can get a hair transplant," Huang said.